If you know me at all then you know that I’m a huge proponent of proper nutrition. It is one of the cornerstones of my ‘Healthy Trinity’ which is the foundation of optimizing health. The Functional Medicine approach to nutrition means that each person has an adequate & functional nutritional status. We have to have enough nutrients to functional optimally. There are multiple aspects of nutrition and they should all be addressed to achieve optimal health & fitness. Certainly, vitamins & minerals are an important component of nutrition and one of the more frequent questions I’m asked is about vitamin & mineral supplementation. I often get blood levels for vitamins such as B12, folate, and Vitamin D to name a few. However, blood levels do not necessarily correlate with intracellular function. Your body doesn’t really care how much is in your blood if you don’t have adequate cellular levels. So, how do you know if you have appropriate amounts of vitamins? In the past I had to assume adequate intake based on proper nutrition and possible supplementation. Not anymore! I perform the Comprehensive MicroNutrient Test through Spectracell Laboratories to better understand each patient’s physiologic nutrition. 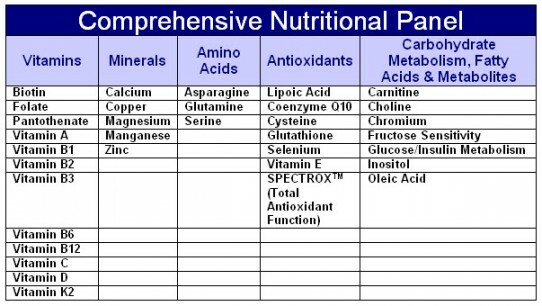 This test provides information on the intracellular levels of 34 nutrients. This test is the best way to determine if you are getting enough of these nutrients in your diet and can guide proper nutritional changes or supplementation. This information can help you identify risks for illness and disease and, thus, prevent them by ensuring appropriate supplementation or nutrition. This test is a little expensive but I believe it is worth every penny. Why assume your nutrient levels are good? I think we should all confirm our nutritional status. The test is covered by some insurance companies. Occasionally, I can get a reduced rate on the test and you can save some money. I recommend calling our clinic in Tulsa, OK to confirm how much this test will cost for you.